The movie resonated with many musicians. Jimmy Page, Robert Plant, Jerry Cantrell, Dee Snider and Ozzy Osbourne all reported that, like Spinal Tap, they had become lost in confusing arena backstage hallways trying to make their way to the stage. When Dokken's George Lynch saw the movie he is said to have exclaimed, "That's us! How'd they make a movie about us?" 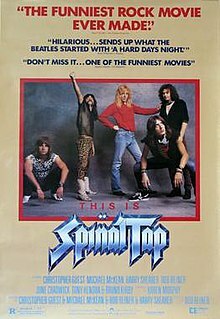 Glenn Danzig had a similar reaction when comparing Spinal Tap to his former band The Misfits saying, "When I first saw Spinal Tap, I was like, 'Hey, this is my old band.'" This page was last edited on 12 April 2019, at 12:41 (UTC).